As parents, we all want to do the best job we can in raising our kids. 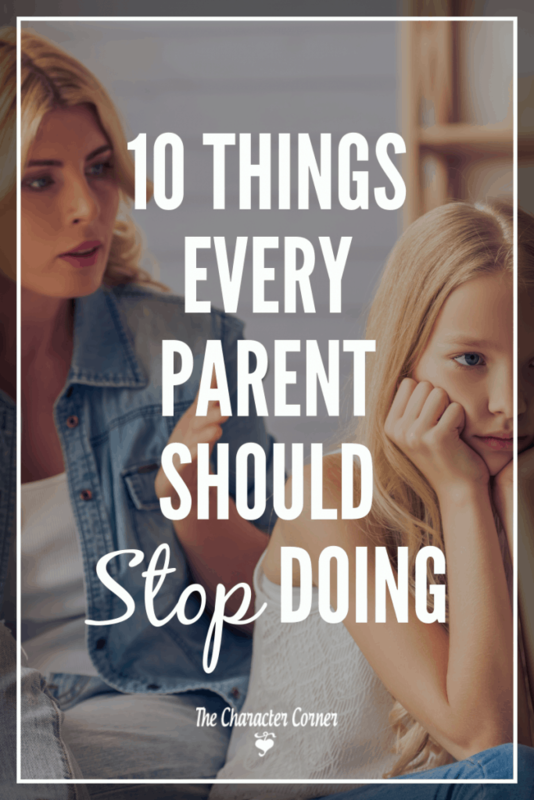 However, despite our best intentions, we often do things that we shouldn’t do as parents. I’m going to share things every parent should stop doing. The list includes things I struggled with from time to time while raising our eight kids. There were times that I would realize what I was doing, and had to tell myself to JUST STOP. 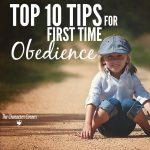 If our kids have the ability to obey after we have told them something three or four times, they are capable of obeying the FIRST time! Why not require it? When our kids are in the habit of not obeying till the 3rd time they have been told, they are doing so with our permission. We’ve unintentionally trained them that way by not requiring them to obey the first time. 2. Stop giving warnings or idle threats. We should stop saying things like: If you don’t do what you’re told, you’re going to be in big trouble! Repeating our commands or giving warnings to get them to listen, is training them to disobey. Children need to learn at a young age that they need to listen to the authority of their parent’s word. 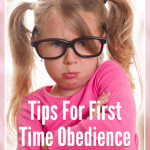 Tell them a few times that they must be obedient, then hold them accountable to listen and obey the first time. It is wrong to hold your kids to a higher standard than you hold for yourself. If we don’t live it, we shouldn’t expect our kids to live it. They can see right through that, and will lose respect for us. 4. Stop being too proud to admit when you are wrong. As parents, we need to be willing to acknowledge and admit it when we have made a mistake, or we are wrong. Don’t excuse or justify your wrongs, but admit and ask forgiveness. Don’t respond harshly to one child and sweetly to another for the same infraction. Don’t give unequal disciplines for similar violations. Don’t ever compare them to their siblings. 6. Stop over-protecting your kids. As our kids get older, we need to gradually increase their independence. They may fail, but that’s how they learn. If we never step out of the way and let them try new things, they won’t learn. We also need to stop protecting them from the consequences of their wrong behavior. If they steal a pack of gum from the store, make them go back in to the store, apologize, and give it back. Our kids need to learn that they have to answer for their actions. 7. Stop criticizing or lecturing them when they share their thoughts with you. When our kids open up their hearts to us, it is NOT the time to lecture or give them OUR thoughts on what they like, want to do, etc. That teaches them that you aren’t “safe”, and they will quit sharing their hearts with you. To him I was saying that his desire was stupid. Why would he want to tell me his thoughts and open his heart to me again? Now I think that there are times when we should sit down and address concerns about things our kids have shared with us, but NOT when they have just told us. WAIT, and bring it up in conversation at a different time, and talk about different thoughts that relate in a non-critical way. 8. Stop scolding or punishing them for something they’ve done in an area where we haven’t trained them. 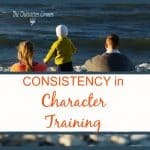 We shouldn’t just EXPECT our kids to know what behavior is acceptable or appropriate if we have never taken the time to sit down and train them in that area. For example, don’t get upset if you take your child to the store and they start running or touching everything, if you never took the time to explain to them how they should behave. Before you go to the store, tell them what your expectations are and do some training to prepare them. We shouldn’t scold or correct our kids in front of others, or talk about their wrong behavior to others. We need to treat them with respect, and discipline them in private. This isn’t just when they are with their friends, but in the home also. We should correct privately, rather than embarrass them in front of their siblings. 1o. Stop comparing yourself to other parents. 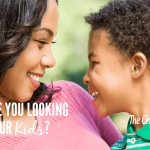 It’s easy to fall into the comparison trap, and feel guilty because you don’t take your kids to the library once a week like other moms, you don’t read to them for 30 minutes before bed, etc. Stop comparing, and realize that you are doing great. You are there for your kids and they know you love themDo those things. You’re doing great, so don’t allow yourself to feel less-than enough! 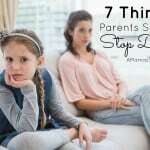 What are some other things parents you think parents should stop doing?